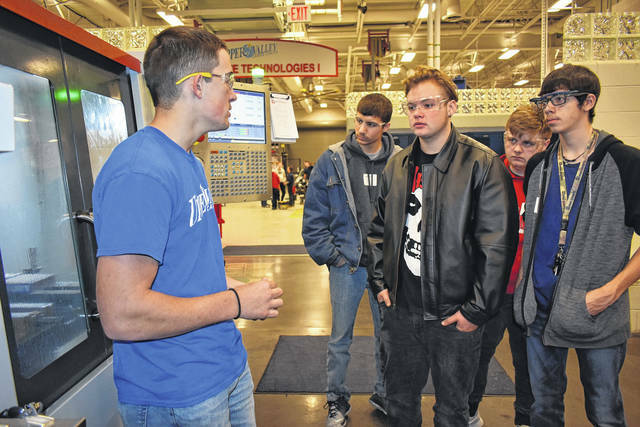 Cody Willoughby | Troy Daily News UVCC apprentice student Isaiah Curl demonstrates the functions of a CNC machine to Troy High School tenth graders Kristofer Aellens, Sebastian Bore, Austin Robinette, and Jesse Symonds during “Explore Career Day” on Wednesday at Upper Valley Career Center. Cody Willoughby | Troy Daily News Auto services instructor Don Wawsczyk discusses automotive technologies with Piqua High School tenth graders Spencer James, Grayson Walker, and Austin Penny during “Explore Career Day” on Wednesday at Upper Valley Career Center. 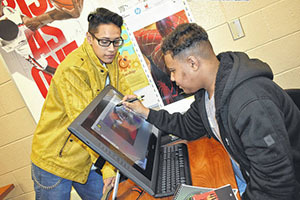 Cody Willoughby | Troy Daily News UVCC graphic arts student Jersain Brux orients Troy High School tenth grader Darin Johnson through classroom arts programming during “Explore Career Day” on Wednesday at Upper Valley Career Center. 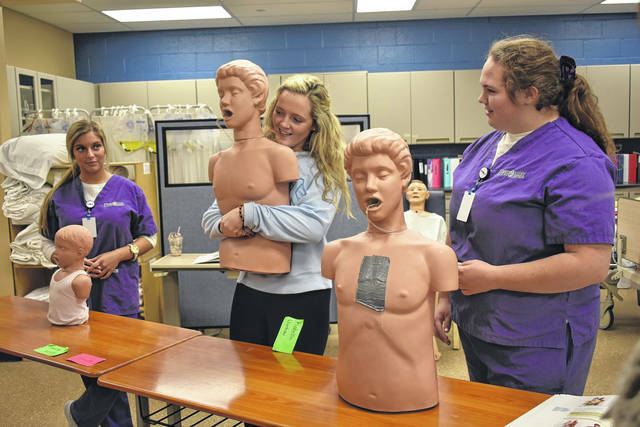 Cody Willoughby | Troy Daily News Piqua High School tenth grader Lauren Karn, with assistance from students Amber Bonner and Hannah Ott, successfully administers the Heimlich maneuver on a medical careers academy dummy during “Explore Career Day” on Wednesday at Upper Valley Career Center. MIAMI COUNTY — Approximately 250 Troy sophomores, 250 Piqua sophomores, and over 1,000 others from schools throughout Miami and Shelby counties attended Explore Careers Day on Wednesday at Upper Valley Career Center in Piqua. The program is an annual outreach the UVCC conducts in order to expose the center’s programs to tenth graders who would like to get a head start on a specialized career. Prior to Explore Careers Day, Snyder visited sophomores at each of the 14 participating schools, accompanied by 25 students currently engaged in UVCC programs. On Wednesday, staff and student volunteers oriented mixed groups of tenth graders through the center’s programs, varying from manufacturing and machining technologies to culinary arts and early childhood care. Many of UVCC’s student volunteers expressed that their participation in the event came from wishes to extend the news of their own positive experience, and demonstrate to underclassmen the many opportunities available. Tonight from 6-7:30 p.m., the center will host an open house allowing sophomores to come with their parents or guardians to enroll in programs for their junior year. According to Snyder, the annual event is made possible by smooth collaboration between UVCC and area high schools. For more information, visit www.uppervalleycc.org.